Philadelphia, PA -- Hanley Ramirez made his Boston Red Sox re-debut a grand one. 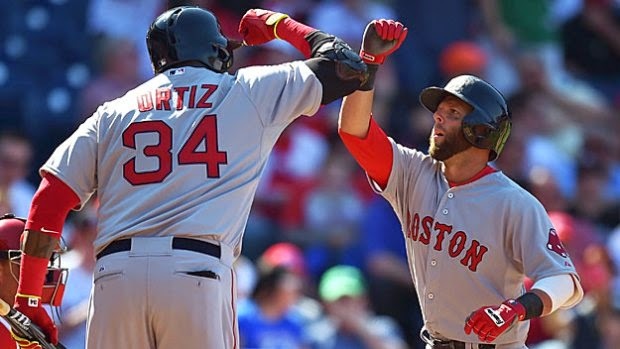 Ramirez smacked a pair of homers, including a grand slam, and the Red Sox blanked the Philadelphia Phillies 8-0 on Opening Day Monday afternoon. Ramirez, who made his MLB debut with the Red Sox in 2005, also had one of Boston's four solo shots off Phillies starter Cole Hamels. Dustin Pedroia cracked two of them and Mookie Betts launched the other one for Boston, which lost 91 games last season after winning the World Series in 2013. Clay Buchholz (1-0) struck out nine and scattered three hits to go with a walk over seven scoreless innings in his first Opening Day start. The Red Sox are ready to compete again following an offseason that saw them open up the piggy bank with the acquisitions of Ramirez and Pablo Sandoval. They also revamped their rotation, bringing back Justin Masterson, while adding starters Wade Miley and Rick Porcello. The additions of Ramirez and Sandoval should help a lineup that last year ranked third worst in the AL with 3.91 runs per game. Sandoval was 0-for-5 with three strikeouts. Hamels (0-1) allowed his four runs on five hits and three walks with six strikeouts over five innings for the Phillies, who went 73-89 in 2014 and finished last in the NL East. The 31-year-old left-hander had only surrendered four longballs one other time in his career (2010) prior to Monday. He concluded last season by going 23 straight starts giving up three runs or less. Pedroia's blast into the seats in left center opened the scoring on the fifth pitch of the game and Betts lasered a first-pitch cutter over the left field wall in the third to make it 2-0. Ryan Howard's two-out double in the fourth was the Phillies' first hit off Buchholz, but he was stranded at second. Carlos Ruiz followed with a walk, but Grady Sizemore grounded out to end the frame. Pedroia and Ramirez both cracked solo shots in the fifth for a 4-0 margin. Ruiz and Sizemore hit consecutive one-out singles in the seventh and Cody Asche's force out put men on the corners with two away. Freddy Galvis struck out swinging to end the inning. Ramirez banged his grand slam off the left field foul pole in the ninth against Jake Diekman. Notes: Buchholz pitched to a 5.34 ERA over 28 starts in 2014 after posting a 1.74 ERA across 16 starts in 2013 ... This is the first time that the Phillies have been shut out on Opening Day since March 31, 1998 against the New York Mets ... Boston was 1-for-7 with runners in scoring position, while Philly finished 0-for-3 with RISP ... Shane Victorino made his return to Philadelphia and went 0-for-3.